Opus 40 is a magnificent 6.5-acre sculpture park nestled against the backdrop of Overlook Mountain. The entire sculpture, built on an abandoned quarry three stories above ground, with pathways 16 feet below ground, and quarry springs tucked throughout, was carved by one man—Harvey Fite (1903-1976)—who took advantage of a cheap, abundant resource: bluestone. Like Fite, Kevin Van Hentenryck is a master sculptor who is committed to using local bluestone. 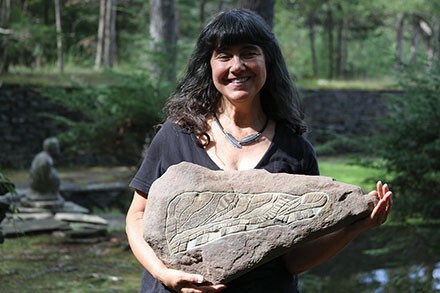 Van Hentenryck will hold two Stone Carving Seminars on August 13 and 14 and September 17 and 18 at Opus 40. Absolutely no experience is necessary to attend the workshop, which aims to promote a shared experienced among participants of all ages and encourage interest in carving. "A lot of people avoid carving because they feel it is too challenging, but I have had four year olds do it," Van Hentenryck remarked. Attendees will learn all aspects of the sculpting process—from concept and layout to surface finishing—picking their own bluestone to carve and take home. No experience is necessary. Participants have the option to attend for a half-day, full day, or both days. Registration fees range from $65 to $220 and advanced registration is encouraged.